Properly built on the southern shoreline of Stoney Lake this exclusive, adult oriented facility offers the finest in world class fly fishing, lodging and dining. Situated in the world famous Kamloops rainbow trout region, fish in these waters are notorious for their incredible fighting abilities. Guests have unlimited access to Stoney and Minnie Lakes. Minnie Lake is a 5 minute drive from the lodge, with both lakes offering opportunities to catch and release trout up to the double digits. Both lakes are surrounded by total private property. 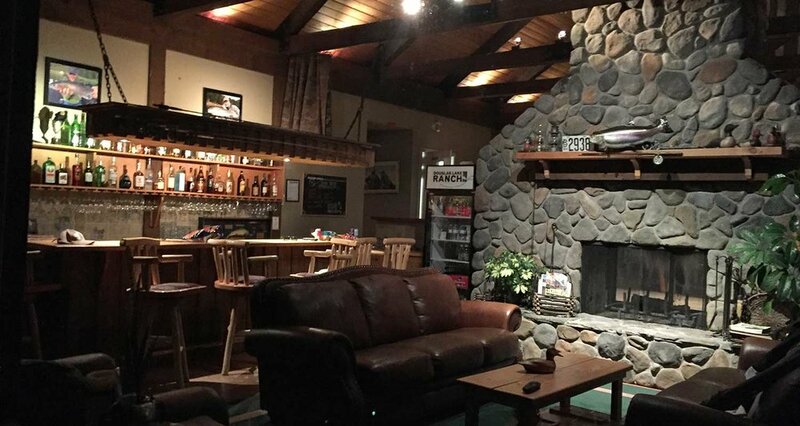 The lodge is furnished with a fully licensed lounge bar, tastefully decorated dining room and large rock fireplace. A large sun deck with hot tub is immediately adjacent to the lounge and makes an ideal spot for outdoor barbecues while enjoying the stunning view of Stoney Lake's famous sunsets. Rainbow trout and bird/wildlife activity can be observed right from the large windows of the lounge. The lodge has 8 tastefully appointed rooms, bringing the total capacity to a perfect 16. Ambiance is important, so the over-all space at Stoney Lake Lodge is usually the first compliment from our new guests. All rooms have two queen beds, and of course, a private bathroom. A single occupant room is set-up for wheelchair accessibility, as well as the entire lodge. Included in our fly fishing and lodging adventures are three meals daily. We take our food serious here. A delicious breakfast buffet, boxed lunches and a hearty dinner are all included. Guests of the lodge can choose how they prefer their lunch plans, to maximize angling opportunities. Dietary concerns/allergies are always addressed immediately. Dinner is provided on the day of arrival as breakfast/lunch are served on departure day. Guests of Stoney Lake Lodge also have unlimited access and fishing privileges on Minnie Lake. Minnie lake has been quoted as one of the top producing lakes in Canada. With maximum sun exposure due to the low lying landscape, prevailing winds and structure, Minnie lake has no shortage of oxygen, or food for that matter.